5-Minute Nighttime Bible Stories are the perfect way to spend time with little ones before bed! 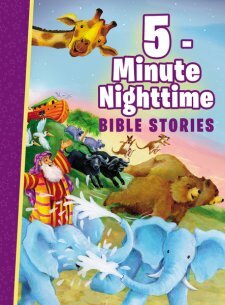 I absolutely love that 5-Minute Nighttime Bible Stories are only 5 minutes. I enjoy reading to my kids before bed and often end up reading very long stories that I didn't realize were so long. Now that we have 5-Minute Nighttime Bible Stories my kids pick one or two stories from the book and everyone's happy. The stories are wonderful and are the perfect way to integrate the Bible into our busy schedules. With 208 pages there's sure to be many stories that will quickly become your kids favorites. The illustrations are beautiful and go with the words on the page perfectly. 5-Minute Nighttime Bible Stories is a wonderful way to send kids off to dreamland! You can find 5-Minute Nighttime Bible Stories on Amazon, Barnes and Noble and other bookstores.